Bangkok Lounge is an award winning Thai restaurant that has two fabulous restaurants; one in Harpenden and one in Shefford. I visited the Shefford restaurant with my husband and would highly recommend visiting this wonderful restaurant. 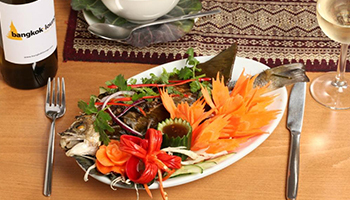 Bangkok Lounge is a welcoming, friendly restaurant that provides both excellent service and food. The manager of the restaurant was at the restaurant when we arrived and the first thing we noticed was his delightful manner to his guests. Any visitor to the restaurant was welcomed by the manager himself and he had a lovely rapport with his diners. Some were regulars to the restaurant and the familiarity and friendliness between him and the diners was charming to see. The décor in the restaurant was also fabulous. The colours and little touches such as the Thai Buddha sculptures and the Thai pictures on the wall really helped create a Thai atmosphere as you were dining. The restaurant also had a lovely outdoor space that can be enjoyed during the day in the summer months. The food at this restaurant was fantastic. All the dishes we tried were presented beautifully and were full of wonderful flavours. To start our meal I had Hoy Obb which is steamed mussels in mixed Thai herbs served with spicy chilli and coriander sauce. The mussels were cooked perfectly and the sauce was delicious. My husband had Satay Gai which is skewers of tender marinated chicken served with a peanut sauce. This dish was presented beautifully and included an amazing flower made out if carrot. It also tasted wonderful. bangkok lounge 3For the main meal I tried one of the Chef’s Special dishes; Gaeng Kaow Goong Supparot. This is tiger prawns in red curry cooked in spiced coconut milk, pineapple and cherry tomatoes. This was accompanied with steamed jasmine rice and it tasted divine. The prawns were cooked beautifully and I absolutely adored the flavour of the curry. My husband chose Stir fried duck breast topped with a homemade Thai style tamarind sauce. This dish was also delicious and again was presented beautifully. Bangkok Lounge also had a lovely range of desserts to finish the meal. Their homemade banana fritter was delicious, and I especially loved the coconut added to this dish. Bangkok Lounge is a fabulous restaurant that serves exquisite food that tastes amazing. All the dishes we tried were very flavoursome and were cooked perfectly. The time and care taken to make these dishes were evident as the presentation of the food was stunning and the flavours were divine. All the staff were extremely friendly and helpful and made our visit very enjoyable. This restaurant is award winning and I can see why. I would definitely recommend visiting Bangkok Lounge Shefford.